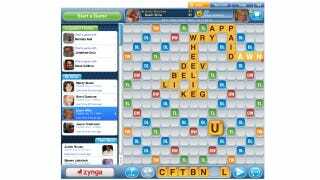 Zynga's scrabble-style word game, Words With Friends is coming to Facebook. Words With Friends will carry over all of the features and functionality from the Android and iOS versions while adding social features. This is the first time Zynga has moved one of their mobile games to Facebook, not the other way around. Adding a little more clutter to your news feed,Words With Friends Facebook version will let you publicly call out your opponents after laying down a 7-letter word and grabbing a dominant lead. Words with Friends will also send players notifications when it is their turn or when they have been challenged to a new game. The new Facebook version will play nice with the original mobile Words With Friends, giving veterans more options to play with and those without smart phones a chance to get in on the action.